If you had the chance what would you ASK ADAM???? And let's see how many we can get him to answer. * Has the style/sound/feeling of the new album undergone a significant change since you began working on it? * What is your very favorite specific place in the world? * What is your favorite childhood memory? * Name one obscure artist that you wish could be mainstream famous. * Do you sometimes get tired of talking about yourself? How do you keep that real and fresh? * You've talked about your 'self-created facade.' Do you think your fans' idea of you as a person is accurate? * Do feel pressure to present a consistent image? * Do you think a lot about making your music accessible? * There's an "ugly-duckling into swan" myth about u. Do u feel like the same person u were as a kid or do u feel transformed? * what was the last thing that made you laugh like crazy? * where do you escape to in your fantasy life? * What do you want your life to look like when you are 70? * Crazy swirl around celebrity makes celebs seem like th most reasonable person in th rm. Thoughts frm th center of th whirlwind? LOLOLOL.... midwifespal, I love how you put NoAngel's question first!!! I want Adam to answer the questions that James Lipton asks all his guests on the program "Inside the Actor's Studio." 1) What is your favorite word? 2) What is your least favorite word? 3) What turns you on? 7) What is your favorite curse word? 8) What profession other than your own would you like to attempt? 9) What profession would you not like to do? 10) If Heaven exists, what would you like to hear God say when you arrive at the Pearly Gates? 1) When you gaze at a full moon, how/what does it make you feel? 2) What's your definition of complete misery? 3) Describe a perfectly blissful day. 4) Can you tell us about your last dream? 5) Do you ever lift weights, or just stick with cardio? Do you see colors when you sing? Can you describe them? 1.) What song if any has ever made him cry??? 2.) What was he thinking about while he was singing Can't Let you go??? It is such an emotional song I had it on repeat after my mom died 2 years ago. And will he ever sing it live??? 3.) What song best describes you and Sauli??? bound to you by Christina or One and only by Adele??? -when songwriting, do you imagine visuals as much as sounds and lyrics? -how do you know when a song is done? -any film directors you really love? or whose aesthetic you would like to explore in a music video? -it seems like in the past year you have gone on a bit of an inner spiritual quest as well as an artistic one. Did anything in particular trigger this? -how much input do you have into your merchandise / fanclub /official website. - who do you use as a sounding-board during your creative process? (you know that person you can talk "at" or who helps you decide when to pull back or when to go further). - do you tend to go with your gut or head when making artistic decisions? business decisions? -what happened to all the raccoons? -on the view you said you kicked down a door, deets? @adamlambert would u consider releasing more than one single before the album drop? @adamlambert Reverse Twitter Party!!! Ask us questions, consider it market research! 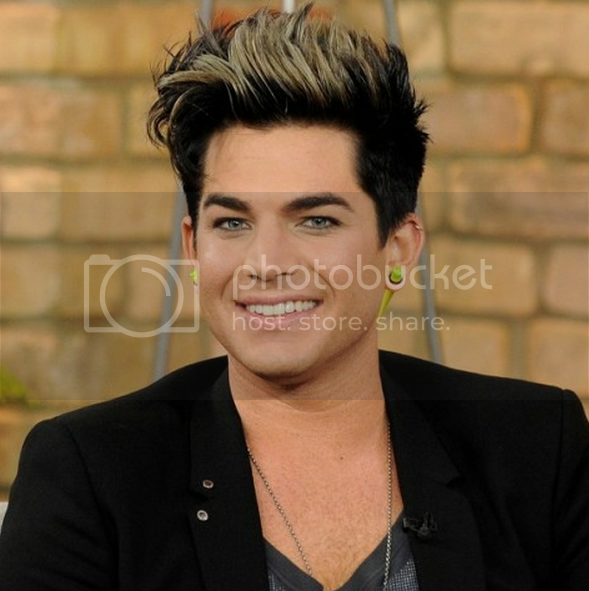 @adamlambert any exciting TV appearances or magazine coverage we can look forward too? Is DMG helping you out? * Do you think of yourself as competitive? * What makes you uncomfortable? * What puts you at ease? * You're obvs great with people. How do you put others at ease? * Name one recent song by another artist that you'd steal for your own if you could. * Do you have a favorite magazine? * What do you procrastinate over? * What thing do you have to do regularly that you think of as your biggest chore? * What thing do you get to do regularly that you think of as your biggest treat? * Which do you find sweeter? Surprises or anticipation? * Tell us the story of how you came to join Queen for a night in Belfast!!! * Any chance you'd pull out "The Show Must Go On" for us again sometime, say, as an encore on tour? QUESTION: How much rehearsal time did you have with Queen before the EMAs? QUESTION: Would you consider doing On with the Show for an occasional encore at your concerts? Question: Tell us the story of the journey to complete this song? What was the process from start to finish? how did the idea to ask nile to play on your song with sam come about? how is your new management going? what inspired your current hair? 1) You clearly thought about fame long before it ever happened to you. You knew/talked to celebrities, wrote Pop goes the Camera, lived in Hollywood, observed from the sideline. Question: How are your thoughts at the time about what it would be like different from the reality you are experiencing now? 2) Tell us about your muse. Is there one? Is it a he/she? Is that muse always around you day and night? Is it easy to follow your muse? Is it like a real person you can have discussions or exchange with or more an energy you are drawn towards? Is this more a conscientious or sub-conscientious thing for you? Which of your songs do you feel is most kissed by your muse? @adamlambert At this point in your life, other than your music & voice, what would you like to be remembered for? @adamlambert What makes you laugh hysterically? @adamlambert Riff will soon be a year old; what have you enjoyed most about being his GF? What do you put on hotdogs? Do you check flyers before grocery shopping? Look to your left. How many framed pictures are on the wall? How often do you clean the interior of your car? Do you ever read the last few pages first? Ever fallen in the shower? How many times do you hit the snooze button before finally getting out of bed? Do you have a garbage receptacle beside you? What's on top? Do you cross out your mistakes or erase/whiteout them? What's your favourite book genre? Have you ever walked out of a movie at the theatre? Do you check your computer's dictionary for the definition of words you'd otherwise feel confident about using during in-person interactions? Just to be sure? Have you ever gotten into an argument on the internet? Did you win? Do you pause movies/TV shows if you have to go to the bathroom or the kitchen, or do you just let them keep playing? If you use a regular alarm clock, do you have it set to music or that obnoxious beeping?